Are D.C's Political Gambling Games Under Review? Colbert I. King writes in his Washington Post opinion column that a possible investigation into the D.C. Council's award of the city's $38 million lottery contract could unveil a cloak of secrecy surrounding online gambling and a host of other issues. "We don't discuss ongoing investigations," D.C. Inspector General Charles J. Willoughby told me this week. "We don't confirm or deny that an investigation is underway," he said. But I concluded from reading between the lines of our conversation that Willoughby is pursuing the July 2010 request by the city's then-attorney general, Peter Nickles, for an investigation of the D.C. Council's involvement in the award of the city's $38 million lottery contract. If that is true and if Willoughby turns loose his investigators (that's a big if), the inspector general may penetrate the veil of secrecy cloaking the council's online gambling shenanigans as well as determine the extent to which — if at all — political connections and cronyism have led to waste and abuse in the lottery procurement process. … Case in point: Intralot, the Greek gambling company that was awarded the lottery contract in December 2009. 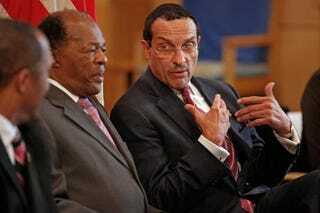 Ward 8 council member Marion Barry told Jeffrey Anderson of the Washington Times in July 2010 that he let Intralot know it needed to take on a local partner if it wanted the council to approve the pact. Barry, according to the Times, said: "I sent word that the contract was DOA without a local partner."